Every company on the planet now has a line of mini-figures. But where did the whole thing start? Look no further than Medicom's Kubrick figures. Oh, sure, there's the Lego and Playmobil figures that predate Kubrick's by many years. 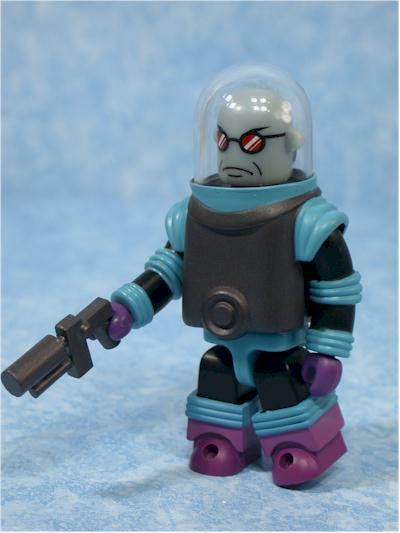 But these were geared towards kids first, and while collectors were becoming a bigger and bigger faction, there were very few licensed mini-figures in either series. Along came Medicom with their Kubrick's, articulated, blocky little figures that they applied to a wide variety of licenses. They were a hit first in Japan, and then here in the States, and it wasn't long before there were Mez-itz, and Mini-mates, and I-Men, and Palz, and Blockos, and GeOms, and several more I'm forgetting. While the competition has heated up, Kubrick's have continued to roll along. 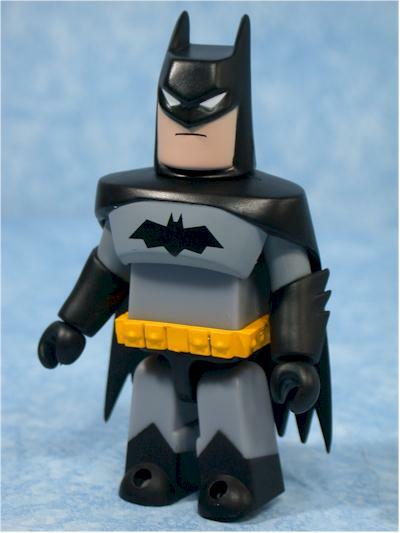 Earlier this year they produced a Batman themed set, and now they have produced a series of eight figures based on the popular animated Batman license. 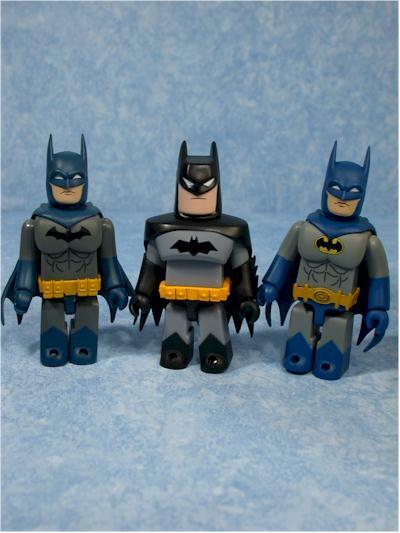 This set includes Batman, Batgirl, Man-Bat, Mr. Freeze, Killer Croc, Harley Quinn, and Blight and Terry McGinnis (from Batman Beyond). Retail on these varies, but you can expect to spend at least $7 or so on each one. The high prices are due to the higher cost of imported figures. Unlike most Kubrick's, which usually come in boxes that don't allow you to see which figure you're getting, these come on standard cards with bubbles. Thank God. I hate playing the character lottery when I'm buying my toys. The packages are fairly sturdy, and small enough to store easily. They are all identical in size as well, so they stack nicely for the MOCer who will put them away. The large Bat symbol looks great, and all the characters are pictured on the back. There isn't a lot of sculpting on these mini-figures. That's never been a major aspect for Kubricks, but there's enough here to make it pretty obvious who each character is. Some translate extremely well, like Harley, Batman or Mr. Freeze. 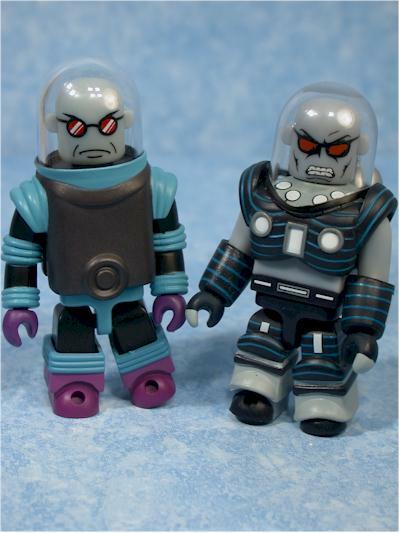 Others, like Terry or Killer Croc, don't lend their likenesses to this style quite as well. 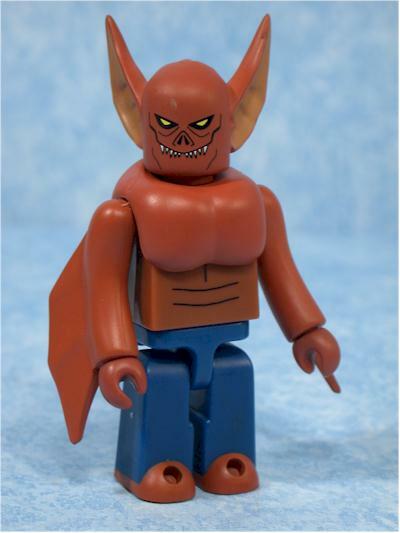 Easily my favorite of this set is Man-bat, and I love the look of the ears and wings. He captures the animated style well, as do they all, and really is pretty damn nifty. Some of the figures don't work quite as well, and I think that the Terry and Blight figures are the worst of the bunch. They aren't as unique or visually interesting as the rest of the series. The paint ops are critical for many of these figures, since they have less sculpting to bring out the detail. Characters like Harley or Terry rely entirely on paint to give us the facial aspects of their figures. Considering the scale, some of the small detail work, like the face, diamonds and collar on Harley, is really amazing. While most of the color is due to the plastic being cast in that shade, there's still plenty of paint work on most of the characters. These aren't quite as articulated as some of the newer mini-figures, but since they were the founding fathers, that not too surprising. They have neck, shoulder, wrist, waist, and hips. You can get them to stand fine on their own, and hold a handful of poses. 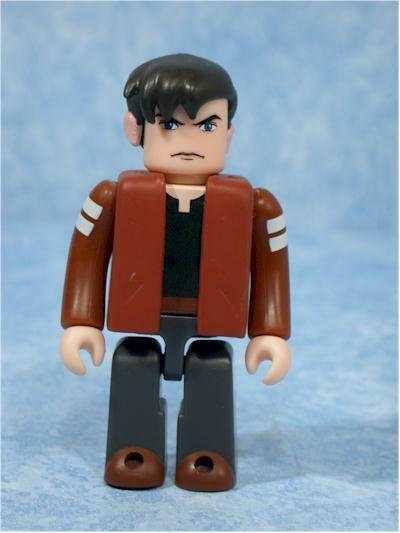 They also have removable parts, so you can swap between some characters, similar to mini-mates. Accessories aren't particularly common with Kubrick's, but always nice to see. Out of the eight figures, only three have accessories, and that's too bad considering that many could have had very sensible add ins. Sure, it might be a little tougher to come up with something sensible for Man-bat or Killer Croc, but Batman and Batgirl? C'mon. 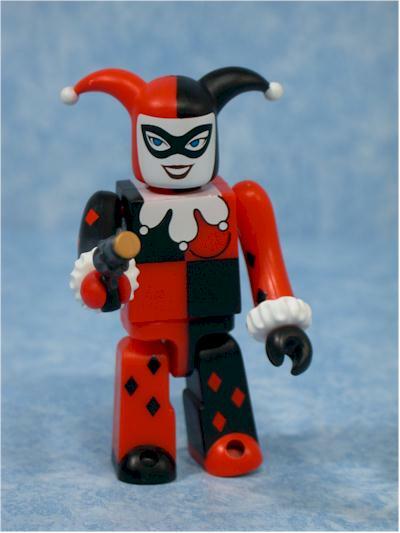 Harley has a gun, styled after a cartoony, Joker-type weapon. You expect the 'bang' sign to pop out, and it fits nicely in her hands. Freeze also has a gun, one of his freeze ray weapons. His helmet is also removable, but I don't consider that an accessory any more than one of the other characters cowls. 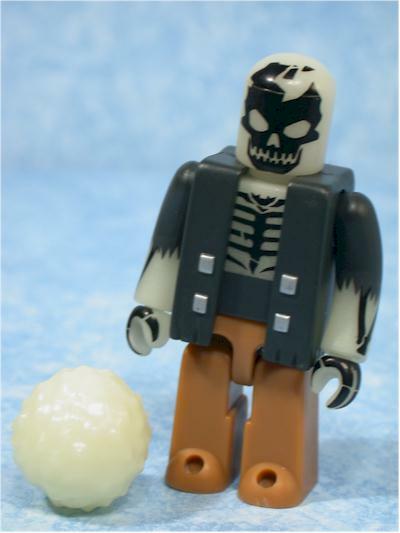 Blight, perhaps my least favorite character of the bunch, has an accessory as well - a ball of energy that glows in the dark. This is a good example of a pretty useless accessory, since he can't hold it, or fire it, but the dog will likely eat it. The Blight figure also glows in the dark himself, at least his head and arms. The feature works pretty good, and he's fairly bright given enough direct lighting in advance. Kids can have some great fun with these, due to the articulation and block style. 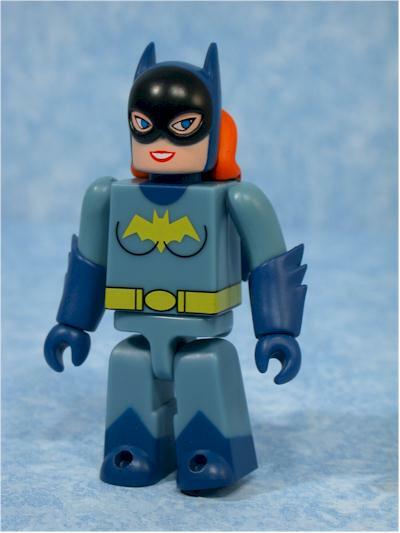 The swappable parts, removable cowls, and small size all make for tons of kid fun. Unfortunatetly, the price and difficulty in locating them probably means that very few kids will ever get their hands on these. Kubrick's aren't cheap, that's for sure. While I expect to get a couple mini-mates for $5 - $7 tops, you're spending $7 - $9 on a single Kubrick. Part of that is due to the cost of importing, but part is also due to them simply being a couple bucks more than they should be. When they were the only game in town, they could command high prices. Now, with other folks entering the arena (and Art Asylum producing the very cool C3 sets with DC characters), they're prices may become an issue for them. This set is really a mixed bag, but if you're a big fan of the show you'll most likely want at least 6 of the 8. The Terry McGinnis and Blight are really only for Batman Beyond fans, and if you prefer the original show, you can stick with the other six. As a matter of fact, two of my least favorite are the two from Batman Beyond. They don't lend themselves as well to the style, and are far less visually interesting. 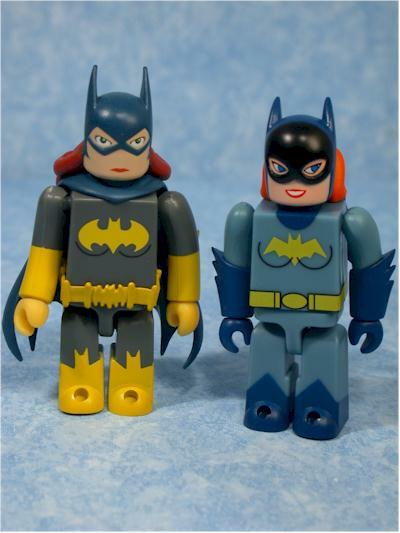 The Batman and Batgirl fit in nicely with the previous versions, and you can't skip Man-Bat or Mr. Freeze. 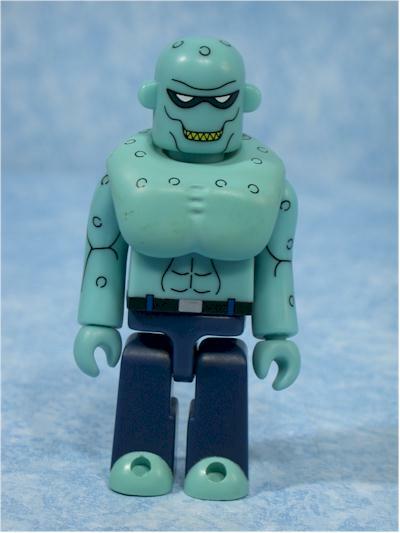 Killer Croc went through some serious issues in making it into this form, but he's pretty important as well, since he's such an unlikely character to be a Kubrick. If you're a fan of mini-figures, then these fit in nicely. I'm happy I picked them up, but could have skipped the two from Batman Beyond and not felt bad. These two are also short packed, so it's nice to know that they aren't as crucial to the collection. I actually ended up with two sets - damn that pre-ordering. Of course, I ordered both through MROTW Sponsors! - Killer Toys has them in stock for $7 each. They had all of the in Chicago and San Diego, but only have Batman listed on their site right now, so you might want to give them a call. 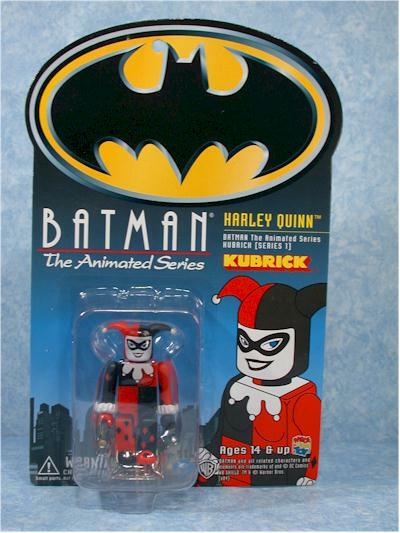 - Action-HQ has them, along with tons of other cool Kubrick's, for around $9 each, or $86 for the full set of eight. The higher price is due to the limited availability of Terry and Blight.